. : Ordering using our PayPal powered shopping cart (PayPal account not required). NOTE: International shipping NOT AVAILABLE. Click here to View Cart and check out. 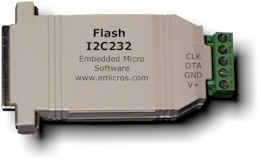 The I2C232 RS232 to I2C adapter from Emicros provides a powerful, low-cost solution to interface to an I2C bus. Now available in 9600, 19.2k, 57.6k, and 115.2k baud rates. Get all the details. Download the user documentation useri2c.pdf (PDF File) or useri2c.zip (zipped Word format) for all the details. Click here to view schematic. The I2C232 provides an RS232 interface to the I2C bus. The interface uses ASCII commands for use with any terminal program. The MicroChip PIC16F876 provides the intelligence and both the SCI and I2C peripherials to power the I2C232 adapter. 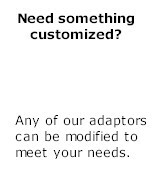 Custom programming is available.